Between UV lasers, X-ray spectrometers, and ground-penetrating radar, it's hard not to be giddy over the hardware NASA's 2020 Mars rover will be packing. In January, 58 proposals were submitted by researchers and engineers around the world, twice the usual number of competition entries. Today, just seven packages were selected on the basis of expanding our understanding of the planet, particularly with new geological assessment tools that can be used to determined potential habitability of the environment. The yet-to-be-named robotic explorer will carry a full compliment of MOXIE to get it through daring situations, a pocket of PIXL for comic relief, and a SHERLOC sidekick for investigating the trickiest mysteries. 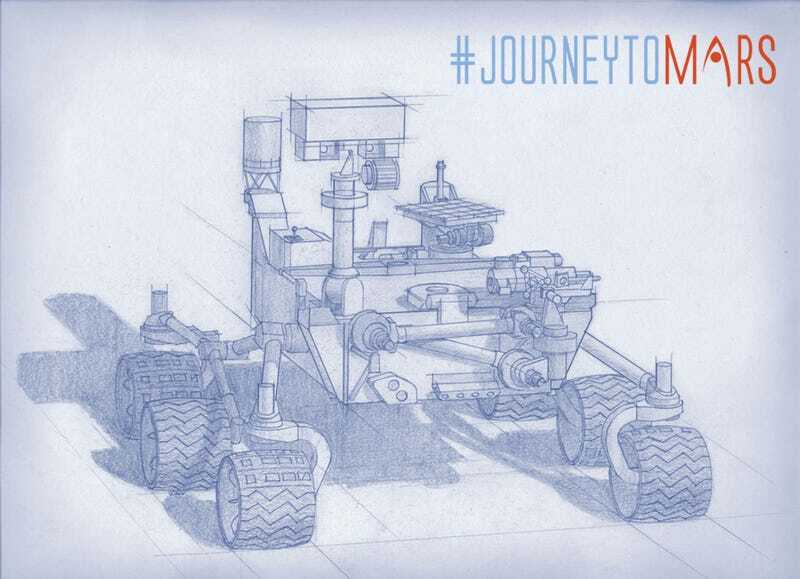 The 2020 rover will be building on the success of Spirit, Opportunity, and Curiosity. It will follow the same proven chassis as Curiosity, with even more sophisticated and upgraded hardware. It's even going to use the thrilling-yet-somehow-most-practical skyhook landing system that Curiosity did, giving geeks big and small another chance to celebrate this moment where reality outdoes science fiction for exotic technology. The conceptual recycling will drop development costs and risks, giving this rover the best shot we can at continuing the grand tradition of long-lived Martian rovers. The new instrument package is oriented towards environmental assessment for human visitors and to directly search for ancient Martian life. It will also collect and store rock and soil samples for eventual return by some yet-to-be-determined future mission. For extra daring, the rover will pack along MOXIE, a technology package to process the Martian atmosphere into oxygen. The multi-layer acronym stands for Mars Oxygen ISRU Experiment, where ISRU is In Situ Resource Utilization. If MOXIE is successful, the technology will open up the pathway for mining the atmosphere for breathable oxygen, and even to locally produce oxidizers for rocket fuels. The perkily-named PIXL is the not-nearly-as-catchy Planetary Instrument for X-ray Lithochemistry instrument, a spectrometer that will use a high-resolution imager and X-ray fluorescence for detailed elemental analysis to a finer degree than possible with any prior equipment. Tapping into our collective adoration of a certain snarky detective, the new rover will have a SHERLOC sensor suite to investigate the mysteries of the red planet. The Scanning Habitable Environments with Raman & Luminescence for Organics and Chemicals spectrometer will use an ultraviolet laser for fine-scale mineralogy, detecting organic compounds, and high-resolution imaging. This will be the first UV Raman spectrometer on Mars, and will work in a complementary manner to several other instruments. Mastcam-Z: an advanced camera system that will send home panoramic and stereoscopic images. Along with creating robotic selfies for whatever charming persona inhabits the explorer, the camera will assist with rover operations and help determine surface mineralogy. The evocatively-named SuperCam, an imaging device with super capacities to perform chemical composition analysis and more mineralogy. This tool will allow the rover to peer around hunting for organic compounds within rocks or weathered soils from a distance, helping identify interesting locations to sample in greater detail. MEDA will turn the rover into a full weather station. The Mars Environmental Dynamics Analyzer is a sensor suite to measure temperature, wind speed and direction, pressure, and relative humidity. As dust is such a defining characteristic of weather on the red planet, it's also going to measure dust size and shape, helping characterize how big of a hassle it will make housekeeping. Not satisfied with only surveying the atmosphere and the surface, the rover has a package just to thrill geophysicists. The Radar Imager for Mars' Subsurface Exploration, or RIMFAX, will use ground-penetrating radar to imagine the subsurface to centimeter-scale resolution. These instruments will be used to determine how future human explorers could exploit natural resources to live on Mars, pinning down limits to how much we could rely on using local materials. It will also be used to further investigate the pesky dust that keeps slowing down our robots, delineating how much of a hazard it would pose to our technology long-term. Best of all, demonstration technology will test out processing atmospheric carbon dioxide to produce oxygen, a key step towards using local resources for both breathing and manufacturing oxidizers for rocket fuel. The less we need to pack with us, the more feasible our chances for making the Next Giant Leap will be. This mission will follow up on the MAVEN orbital spacecraft that will investigate the Martian upper atmosphere starting this September and the 2016 InSight lander to investigate deep structure.